When it rains, it pours. After being knocked out in bed for a full week with the flu, I was so excited when I finally started to feel better and we headed to Bonita Springs for Labor Day weekend. I was psyched to a) be healthy and b) have the chance to float around a lazy river for a few days with my sisters. 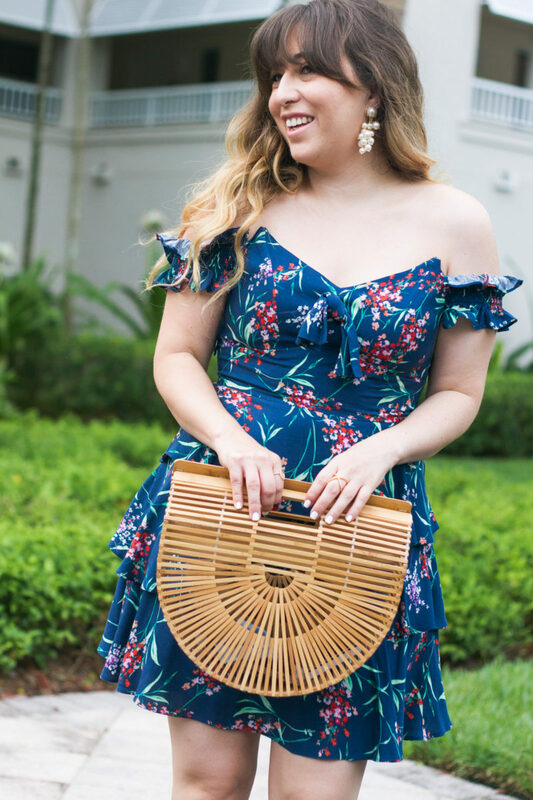 I couldn’t wait to get away and to wear pretty dresses again and to shoot some cute looks for the blog… basically, to get back on a normal schedule. After being cooped up in bed for a week and getting absolutely zero work done, I was relieved to get back to normal. Then, while on our trip, we heard about Hurricane Irma. We were in Bonita Springs at our resort when we got the news that the storm was headed our way. While poolside, we heard a lady from Miami on the phone, talking about how the lines wrapped around Costco before they even opened as people frantically searched for water. We decided to scour Bonita Springs for water and batteries, thinking that we’d have better luck than in Miami… unsuccessfully. Every store we went to was totally wiped out. We headed back to Miami, determined to do our prep and get our shutters up early. We knew right away we would have to evacuate… we live 2 miles from the water and have to evacuate for anything stronger than a 2. Our yard basically floods in a bad rainstorm! We lived in one of the hardest hit areas of Hurricane Andrew when I was in second grade… I still remember what it was like, how scary it was, and what happened afterward. We completely lost our house… while we were in it. When we heard the window in our house break during Andrew, we ran out to my dad’s car in our garage and lay in the trunk area with a mattress over us and waited out the storm there. I remember never being so scared in my whole life… so scared I threw up on my aunt’s bathrobe! We moved around for a year, staying at family members’ houses, in an apartment we rented in Miami Beach while we rebuilt our house. Horror stories from Texas and Harvey didn’t help. With all that in mind, we grimly prepared for the worst, assuming that anything we left behind in our house would be lost. I literally put everything I own in ziploc and garbage bags and packed a small suitcase with my favorite things. (Actually considering doing a blog post on which beauty products I saved and brought with me lol.) The news kept hammering how bad the storm was going to be, how it was so much bigger than Andrew, how strong the winds were, which only served to make everyone way more stressed out. Suffice it to say, I didn’t have the mental energy to post on IG or the blog. I had a week’s worth of beautiful photos from our weekend in Bonita, but obviously the pressure of potentially losing our house and the stress of packing up everything we own was more important. I knew you’d understand if I extended my little break until things calmed down. When we left the house, we thought it would definitely be for good. We hunkered down at my grandma’s house for the storm, bingeing on hurricane snacks and Netflix shows. I frantically conserved my battery, waiting for the moment we lost power… and a/c. At the end of it all, we lost power for 24 hours. We were cooped up in the house for about 48. We checked out our house yesterday morning and were relieved to find it mostly all right. A lot of fallen trees, our gate fell over, and we’ll need to replace our pool pump. Other than that, our house looks to be ok! We don’t have power at our house, so for now, we are staying at my grandma’s house. Hoping we’ll get power restored soon! I can’t wait to get home and get back to normal. In the meantime, I wanted to share a blog post with an update on what’s been going on, and to thank you for being so patient the last few weeks with my online absence. 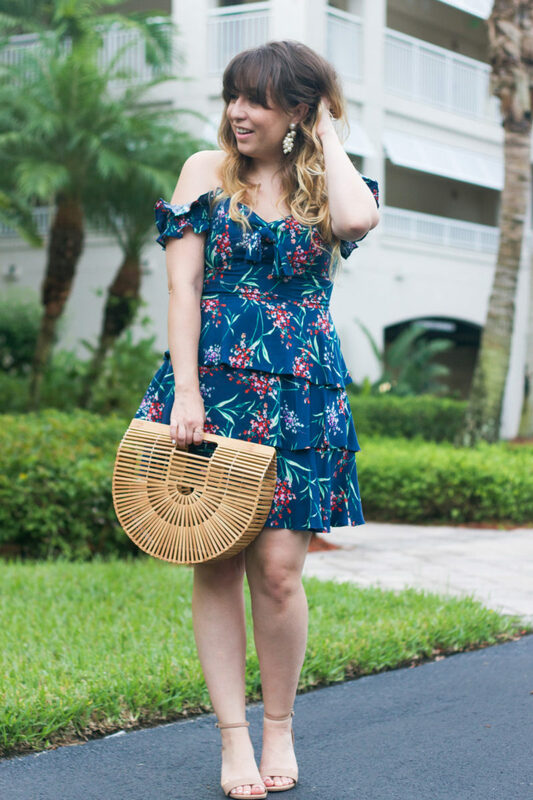 I’m also itching to share photos from our long weekend in Bonita Springs! We had such a nice time together… my sisters drove down from Tallahassee and we had a great time hanging out. We stayed at the Hyatt Residence Club Coconut Plantation… we love it there! They have a gorgeous pool area and lazy river. The apartments are spacious and beautiful and the property is just so, so pretty… perfect for photos! 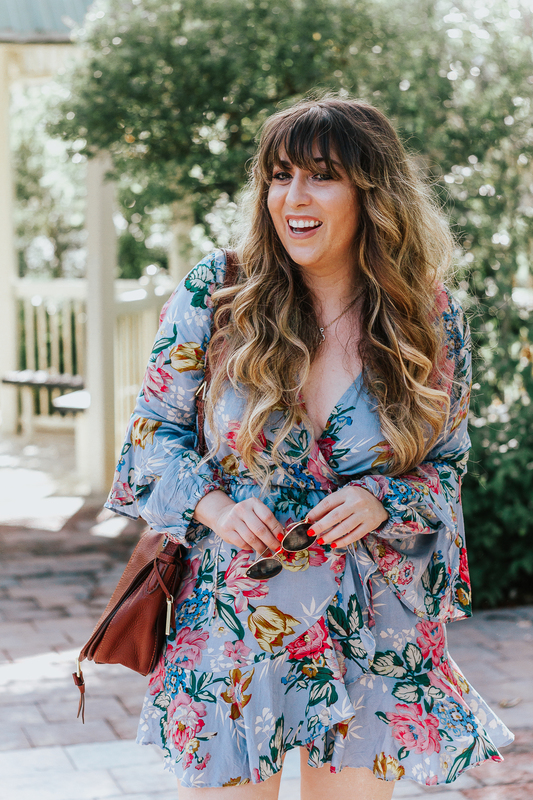 I wore this gorge floral dress that is perfect for the last days of summer. The fit was super flattering and I just loved the sweet floral print and the tiered ruffle skirt. I paired it with my new favorite earrings… these pearl cluster statement earrings from Baublebar that will transition into fall… can’t wait to pair them with chunky sweaters! Thank you so much for reading, for your neverending support, and for your patience the last few weeks with my absence as I’ve battled the flu and now a hurricane. Love you guys so much and am so grateful for you! Florida friends– how did you ride out the storm? Are you ok? Please hit the comments and let me know how you are doing!